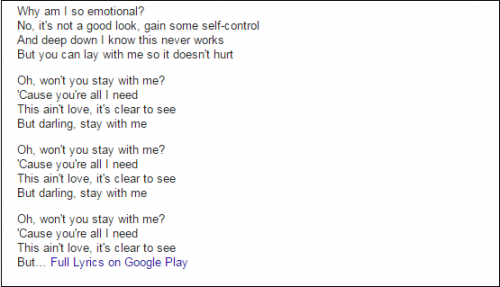 Google has added a special song lyrics box to the search results pages when you search for any song along with lyrics on Google. This box has been added for queries owing to an increasing number of people searching for song lyrics. Although this feature currently shows a handful of tracks and users in America will get full lyrics for songs along with search results. This new feature is the latest feature rolled out as a part of Knowledge Graph of Google. This has been done to allow users to get answers to their queries for song lyrics without multiple clicks. Yes, Google has added this handy ability to see results for song lyrics on the search page but at the same time, Google is not scraping the lyrics sites. When you will see the search results, you will notice a link to Google Play that says Full Lyrics on Google Play. When you click on Full Lyrics on Google Play, you will be directed to the Google Play Store from where you can make the purchase. This step has been taken to make the search results more helpful and useful. For users, it is the best way to get the lyrics with least clicks and time. Google has included a Feedback link where you give feedback about this newly included feature. Microsoft’s Bing has started added full song lyrics in October and now Google has also started including lyrics in the search results. 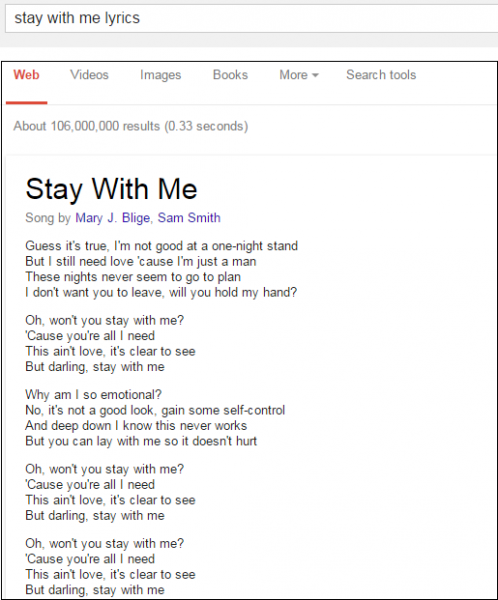 Google is working to include more lyrics in the database. Web searchers will be able to gain access to song lyrics without having to click through several ad-infested lyrics websites. The new results are only available to Google users of US English. What are your views regarding this song lyrics update by Google? Do you like this? Share your thoughts in the comments section below.